We Finish in Rome | Sprezzatura, Y'all! Myra’s flight left from Rome, so we saved doing all that was Rome for the end of her trip. By then she had visited Florence, Venice, Tuscany and Umbria. She had dined in Italian homes, met and got to know families, walked hill towns, sampled the unique local products and had personalized pasta and pizza making lessons. She was an Italian pro. But she hadn’t seen Rome. And until you see Rome, you haven’t really done Italy. Rome is a city of contradictions. Modern, ancient, convenient, arduous, expensive, affordable, magnificent, shabby. But it’s Rome. We always stay on the Aventino Hill. It’s a little outside the normal tourist areas, but it’s a wonderful oasis from the hustle and bustle of those parts of town. It’s got a lot to offer: great views of Rome, the key hole (more on that later), and at the bottom of the hill, the Testaccio district, which is a food haven. Monte Testaccio is an artificial hill made up of garbage. The garbage in this case being old amphore, or ceramic olive oil containers. They piled them up in an amazing way that made a hill and today goats roam over the “hill” and treasure hunters climb around looking for the ancient pottery shards. Later, the area become the meat processing area for Rome. Today it’s all about food, full of great restaurants, the best market in Rome, and wonderful shops. Aventino is home to some of the best kept secrets in Rome. The key hole being the foremost. The key hole is at the headquarters of the Knights of Malta. It has a rich and storied history, with Dan Brown intrigue. It was a palace, then a monastery, then the headquarters of the Knights Templar, then the headquarters of the Knights of Malta. I’m way too Protestant to figure all this out, but I can tell you that the view through the key hole is pure holiness. 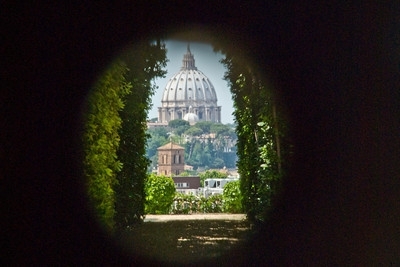 You look through it and a tree lined alley opens up to a perfectly framed view of St. Peter’s Basilica. And the Orange Garden. It’s a garden full of orange trees and couples making out. Don’t know why this became the place for make-outs, but everywhere you look you see a couple making out. It’s actually kind of nice – this is a beautiful place and a great park with plenty of secluded benches that are perfect for a public display of affection, so why not? And at the end of the garden is a great view of Rome and the Tiber. For dinner that night we went to a great restaurant near Piazza Navona, called Settimio al Pellegrino. We strolled through Piazza Navona on the way there and took in the street scene. This is a place that’s a zoo during the day and takes on a different life after the sun goes down. The crowing glory of the piazza is the center fountain by Bernini, The Fountain of the Four Rivers. It’s an incredible fountain depicting the greatest rivers of the four known continents at the time. The Nile, the Ganges, the Danube, and the Rio de la Plata. Settimio al Pellegrino is an experience. You HAVE to make reservations. They won’t even let you in if you haven’t called first. And they don’t speak much English. This is an old school Roman restaurant and is full of locals. You have to ring a door bell to get inside, no wandering in off the street. Once your reservation is confirmed you’re in. They have so few tourists visit that they only have two English menus. At the next table to us, there were two American women and the five of us shared the two menus. One of them spoke very good Italian and helped us with the very bad English translations. This place is family run and the husband works the front and the wife runs the kitchen. The food is very straightforward and good and the portions are small. It’s one of the few places I’ve eaten in Italy where you can actually have a pasta and a meat at the same meal without feeling stuffed. The next day we started our Roman tour. We visited the Colosseum, the Roman Forum, and St. Peter in Chains church. It was a beautiful day with a crisp start and it was perfect for walking around ancient Rome. The Colosseum is breathtaking. I remember the first time I saw it and how I felt. It’s something you’ve seen thousands of pictures of and its basic design is still used in modern day arenas. It’s such a timeless symbol of the Roman Empire and its architectural beauty belies the carnage that took place inside. Staged battles, man against wild animal, man against man – all to entertain the masses. What passed for entertainment 2,000 years ago is puzzling. One of my favorite places in Rome is the Roman Forum. The central marketplace and seat of government of ancient Rome. It’s the place, to me, where you feel the closest to how life was then. Pagan temples evolved into Christian churches, a republic government was developed, monuments erected to victories abroad – it’s all in the Forum. Dating back to the 7th century B.C. when what was a marshland was drained to build this massive marketplace, it thrived until the Dark Ages, when the Roman Empire fell. It was stripped of it’s ornate facades and marble coverings and largely used as a garbage dump and pastureland until the 18th century, when archaeologists began to excavate it. Work continues on excavating it and every time I’ve visited there are groups of archaeologists dutifully digging away at the treasures buried beneath the soil. 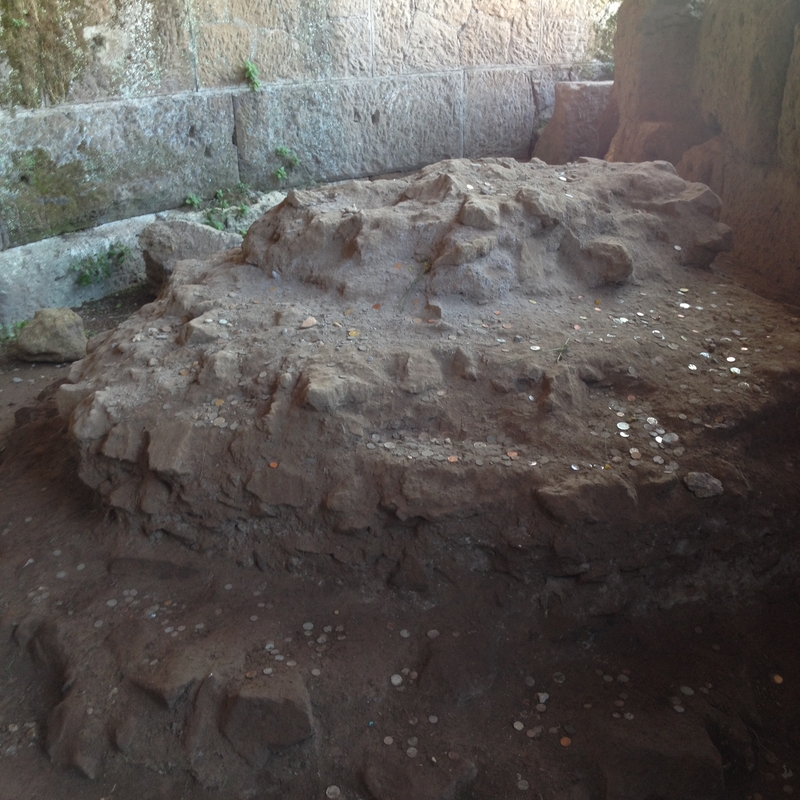 The Roman Forum is also where Caesar’s body was brought after he was murdered. “Friends, Romans, countrymen, lend me your ears. . ” – Shakespeare’s words, not necessarily Marc Antony’s, but the site of the fictional speech nonetheless. Today the slab of rock upon which legend has it Caesar’s body was laid for all of Rome to see is covered in coins. Presumably as an offering for luck or something. Caesar didn’t have such great luck there at the end, but maybe the gods smile upon those who honor his contributions by tossing a coin or two at his resting place. St. Peter in Chains church is definitely worth a visit and it’s not far from the Colosseum. It’s a beautiful church, but there are two main draws, in my opinion. One is Michelangelo’s Moses sculpture. 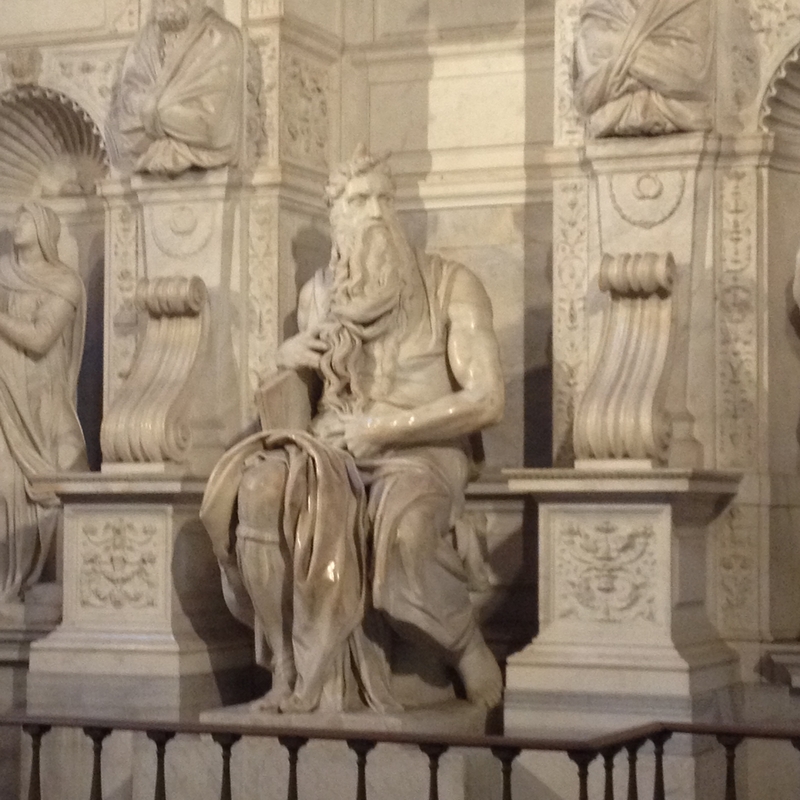 Commissioned for the tomb of Pope Julius II, it depicts Moses just as he came down from Mt. Sinai with the Ten Commandments. On his head are horns, which is based on the translation at the time which confused rays of light (halo) with horns. There is some controversy about this interpretation, but that is for discussions far more scholarly than this. Regardless, it’s a wonderful sculpture and it makes you wonder how Michelangelo had time in his life to do everything he did. The other notable thing in this church is the thing which gives it its name. St. Peter’s chains. There’s a legend here. 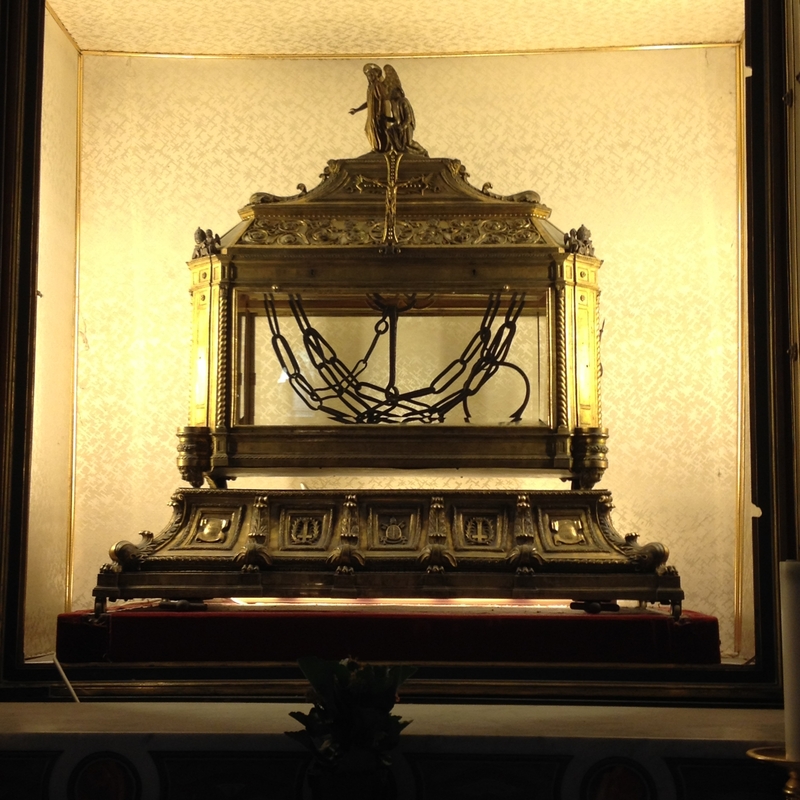 In a glass box at the alter are intertwined chains. One pair bound St. Peter when he was imprisoned in Jerusalem and the other when he was imprisoned in Rome. When the two sets of chains were brought together they miraculously fused together and have remained so ever since. After all that, we needed lunch. We headed for one our favorite restaurants in Trastevere (this means across the Tiber – Tiber is Tevere in Italian), Romolo. Romolo has a legend behind it, too. Hey, it’s Italy – there are legends everywhere. Supposedly the artist Raffaello was commissioned to do some frescoes in the nearby Villa Farnesina ( a wonderful museum now, if you’re ever in the area in the morning – they are closed in the afternoons). The restaurant Romolo was then a tavern and the owner’s daughter was reputedly quite lovely. Raffaello used to frequent the tavern and struck up a love affair with the daughter. Around the same time, Michelangelo was working on a little project over in the Sistine Chapel and commented that Raffaello spent more time at the tavern than he did working on his commission. We decided not to push ourselves and headed back to the hotel to relax a little. We had dinner that night in our neighborhood at a seafood place we’ve been to many times, Taverna Cestia. Great seafood and we had a great time eating and speculating about all the other patrons. Religious Rome was on the agenda for the next day. The Sistine Chapel and St. Peter’s. 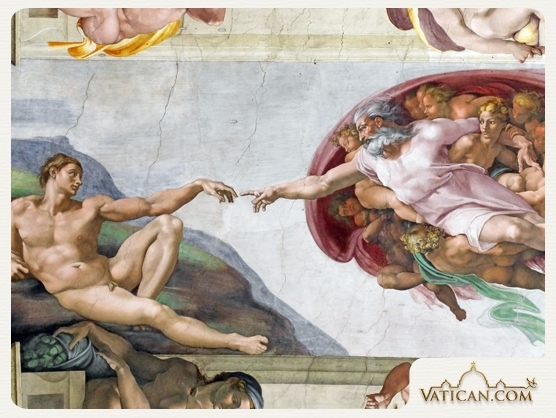 The Vatican Museum, which you have to go through to get to the Sistine Chapel, is an unbelievable collection of art. It’s a little overwhelming to me. There’s so much of it and it just keeps going on and on. At some point, I would like to take a tour because I’m sure I’m missing so much with my ignorance of art. The building itself is a work of art. You go through a series of rooms and galleries that are incredible on their own. And at the end of it all is the Sistine Chapel. You can’t take pictures in there and you all know what it looks like, but here’s a shot from the Vatican website. 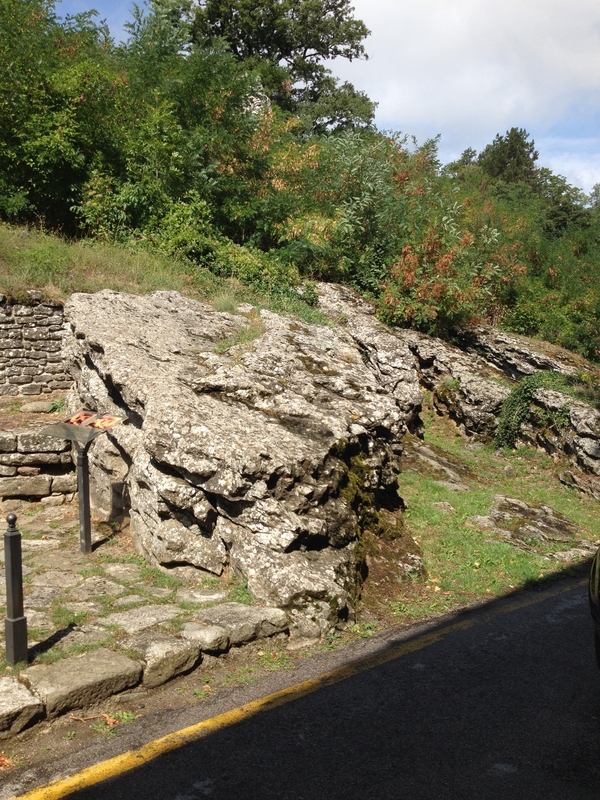 The pose and background for Adam was supposedly inspired by the rocks near Chuisi della Verna, which is near Anghiari. Michelangelo said that he saw this rock formation and thought it would be a great setting for a human form to drape across. He was right. 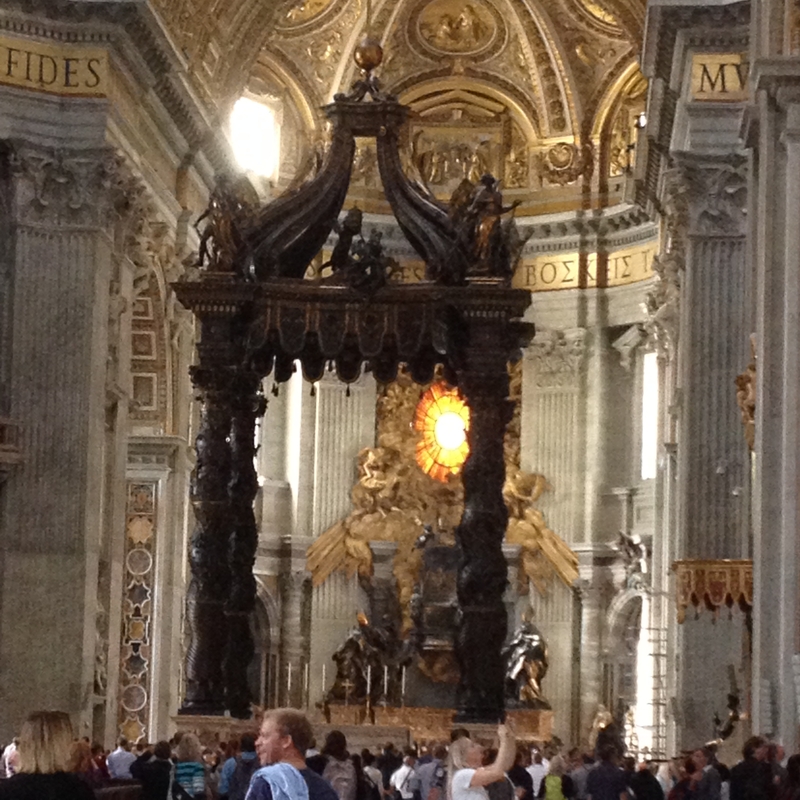 After the Sistine Chapel, we went through St. Peter’s Basilica. While Steve was waiting in St. Peter’s square for Myra and me to finish the Sistine Chapel, he saw the pope! On Wednesday mornings the pope has an audience with groups in the basilica and the square. He was quite a way away and couldn’t get a picture, but he saw him. Pretty cool. 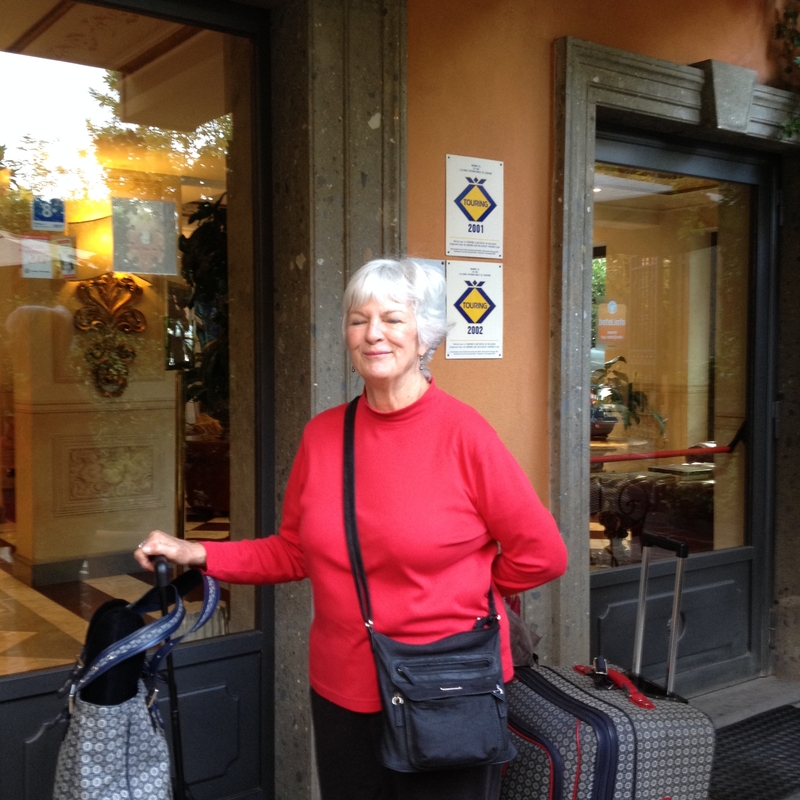 As our day wound down, we realized that it was the last night Myra would spend in Italy. Very sad for us. We did almost everything we had planned on doing and satisfied all but one of Myra’s requests (didn’t make an opera) and we probably ran her ragged. But we had one last meal that we had to squeeze in even though we really weren’t hungry. For our last meal we went to the Jewish Ghetto to Nonna Betta. It’s a great traditional Roman-Jewish restaurant that we love. It was wonderful, but we were all a little over the top with food by then. We ate and enjoyed, but our stomachs were begging us to stop. We did it. We ate until the last moment. We savored every bite. We did not surrender to the food. The next morning Myra packed her bags and made her way to the airport. We found ourselves just two again (three with Millie). We loved having her visit and hope she enjoyed the experience as much as we did. I think (hope) that she will reflect back on this experience and remember little things that made it special. The way Italians wrap your purchases like they’re works of art, even though it may be just a bar of soap. The older ladies peering out of the windows at the street scene below. The older men gathering in the piazzas to chat and watch the world go by. The two hours lunches. The celebration of food, wine and life itself. The siestas that always throw us for a loop when shopping for food. The lyrical language that begs you to learn it, knowing you’ll never be able to speak it with the same emotion as the natives. We miss you, Myra. And we’re sorry we couldn’t figure out a way to get you to an opera. This is for you, la nostra cara amica. I hope it doesn’t keep you awake! This is so wonderful, Cathy! 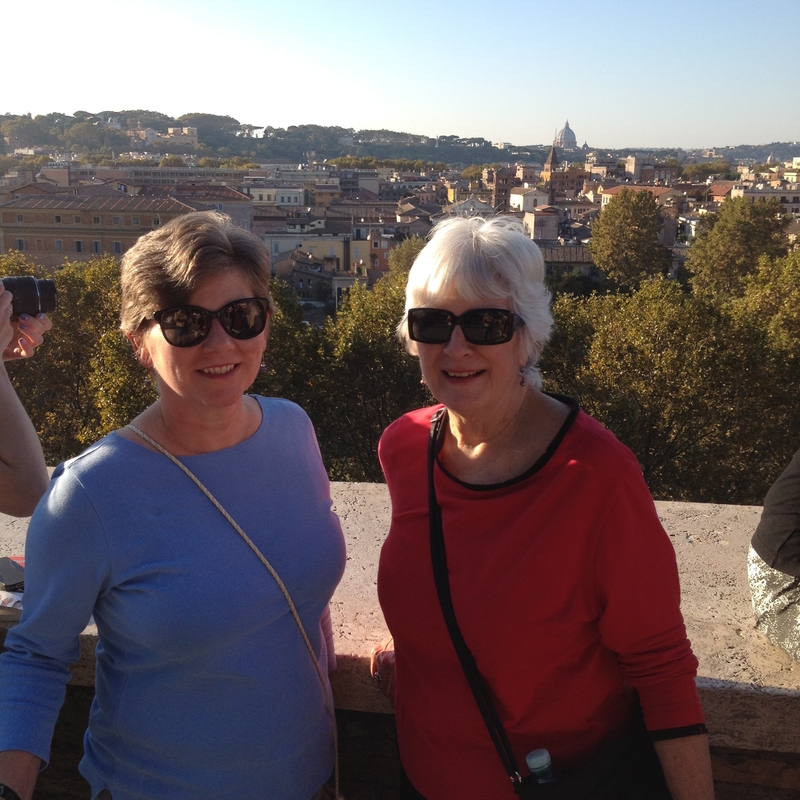 What a trip, Myra had…and what a pleasure to share Italy’s gifts with a special friend. (Hey — I hope you’ll also share some of those restaurants with us:-) YUM!! Of course! Looking forward to your visit and seeing you both again. It’s been so long!